The young people, from organizations in each of the neighborhoods, were gathering data for a report aimed at supporting changes in waste zoning policies that would ease the load on traffic-intensive intersections. They represent a growing number of citizen scientists all over the world who are using new technology to improve the quality of life in their own communities — and to help the planet. In this case, the new technology is an instrument called the AirBeam. Supported by foundation grants, government agencies, and crowdfunding, the device was designed, programmed and tested by high school STEM (the acronym for science, technology, engineering and math education) students in Queens and is manufactured and sold by Habitatmap. 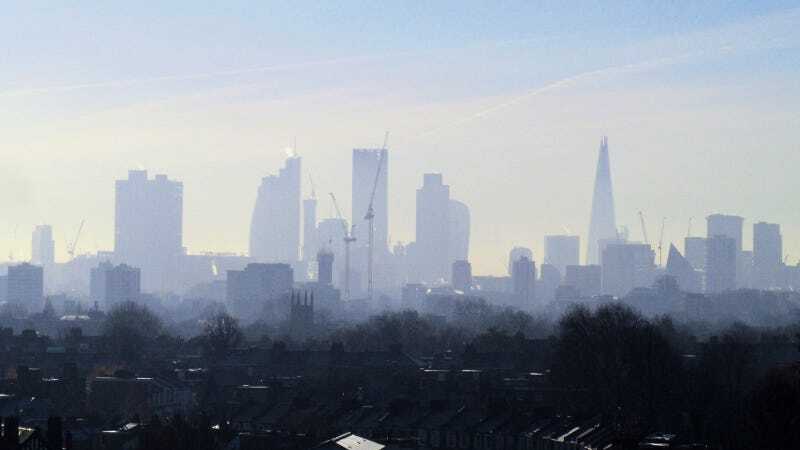 The monitor uses a light-scattering method to measure fine particulate matter, or PM2.5, which can be dangerous for human health and also contributes to global warming. Together, automobiles and trucks account for nearly one-fifth of all U.S. emissions, spewing out about 24 pounds of carbon dioxide and other gases for each gallon of gas. Moreover, PM2.5 particles can travel deeply into the respiratory tract, causing short-term health effects — irritation to the eyes, nose and throat, coughing and sneezing — as well as long-term damage to lungs and worsening such conditions as asthma and heart disease. One study estimated that, in New York, chronic PM2.5 exposure from on-road vehicle emissions contributes to 260 deaths from respiratory and cardiovascular disease, and 720 emergency room visits and hospital admissions annually. Among these, fumes from buses and trucks account for the largest share of the city-wide burden, contributing to 170 deaths each year, according to the study. Man wears Airbeam LED mask. The AirBeam device works by sending air through a sensing chamber where light from an LED bulb scatters off particles in the air stream. This light scatter is registered by a detector and converted into a measurement that estimates the number of particles in the air. The measurements are sent via Bluetooth once a second to a smartphone Android app, which maps and graphs the data in real time. When the monitoring session is over, the data are sent to Habitatmap’s AirCastingwebsite, where the information is “crowdsourced” with data from other AirBeam users. The statistics then collectively generate heat maps indicating where PM2.5 concentrations are the highest and lowest. Earlier this month, the Global Climate and Health Alliance, a coalition of physicians, health professionals and public health officials, launched Unmask My City, a global initiative to fight for cleaner air in ten cities, including Sao Paulo (Brazil), Chennai (India), Warsaw (Poland), Belgrade (Serbia), Emalahleni (South Africa), Adana, Hatay and Istanbul (Turkey), London (England) and Salt Lake City (US). “Citizen scientists” in India have been testing air quality since 2012, although they have been using a different device. In Ennore in north Chennai, for example, Community Environmental Monitoring (CEM), a project of The Other Media, has been sampling various toxic hotspots to measure PM2.5 and harmful metal pollution in dust. Testing they conducted in April revealed levels high enough to be deemed “unhealthy” or “very unhealthy,” according to the organization’s 2016 report. A second, similar reportfollowed two months later. This certainly proved true in the aftermath of the New York City findings. There, students counted as many as 304 trucks per hour at intersections in the South Bronx, and measured particulate concentrations up to seven times higher than those tallied by the nearest state Department of Environmental Conservation monitoring station, according to the report. In fact, the South Bronx recorded the highest number of trucks per hour, most of them carrying trash. The area also had the highest concentration of asthma–inducing pollutants in six heavily trafficked areas. North Brooklyn showed up to 203 trucks per hour on weekdays, about a third of them commercial waste trucks. Pollutants were up to five times higher than the average for that area, according to the report. In Southwest Brooklyn, they found four times greater concentration of pollutants than the average for the area. “If you are going to implement policies to clean up the air, you need to make sure you address the inequities distribution of air pollution, which is strongly related to the distribution of noxious industries, and waste transfer stations,” Heimbinder says. The work of the students documented the need for a plan recently announced by the city to implement a “zoned” waste collection system. By dividing the city into zones, and having commercial hauling companies bid for service contracts (rather than requiring private companies to hire their own waste-hauling services) a city study found the number of miles traveled by private collection vehicles would drop by an estimated 49 to 68 percent due to the reduced number of trucks on the road. “The city has committed to doing it as a result of these groups doing what they did,” Heimbinder says. Originally published by Nexus Media, a syndicated newswire covering climate, energy, policy, art and culture. Illegal Wood: How Much are US Companies Contributing to Papua New Guinea’s Logging Crisis? Corals are Overheating. This Inventor Thinks He Knows How to Cool Them Off.